My favorite place in San Dimas! Great place to enjoy a phenomenal coffee or tea (my favorite is their iced chai latte), in a friendly environment. A family-run place, very personable, quaint outdoor seating. In a world filled with Starbucks, you got to love a place like Rail Side Cafe! This small, friendly cafe offers delicious coffee and tea as we sat outside enjoying the scenery and breakfast. Many locals here with their dogs, blankets available for cooler weather. Clean and quaint. I've been here a few times for an egg white spinach panini and coffee. 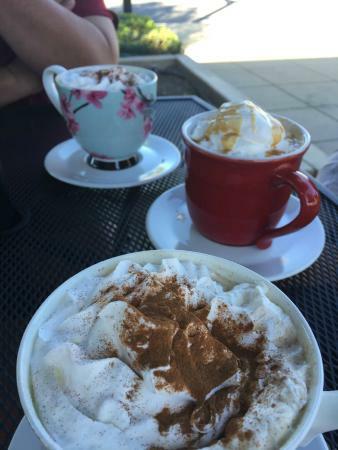 Quaint outdoor seating, rich bold coffee and delicious lattes. Service is a little slow but all in all very friendly and helpful. Great very casual breakfasts and lunches. Hands-on owner. Very personal attention and good food. Anxious to please their clients. No big-chain impersonal experience, which was great! Cute downtown location and a very friendly employee who welcomed me and took the time to talk about the menu and make small talk. Street is a little busy, but the benches and tables are nice. Get quick answers from Rail Side Cafe staff and past visitors.